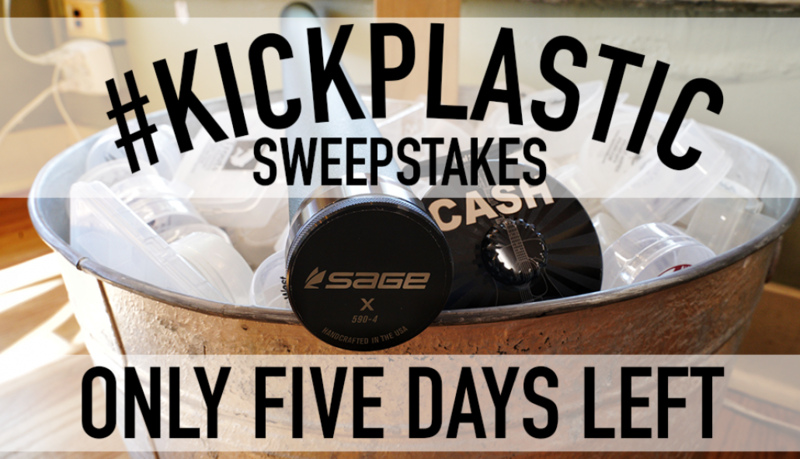 The #KickPlastic Sweepstakes is coming to a close in a mere 5 days. So, if you still have some old plastic cups lying around - bring them down to the Trouts Denver or Trouts Frisco locations to earn your entry into the Sweepstakes to win a Sage X 9 foot 5 weight and Abel Johnny Cash Limited Edition Super Series Fly Reel! We couldn't be happier with the haul of old plastic fly cups we've collected thus far and we're looking forward to closing out the month of September strong! If you've already entered, start digging deep in your gear bags and try to find a couple more of those plastic fly cups to bring in. If you haven't dropped off your old plastic fly cups, we know you've got a secret stash of these plastic cups hanging around, ready to be recycled. If you're unfamiliar with how to enter the #KickPlastic Sweepstakes, here's a quick rundown: Through September 30th, 2018, for every plastic fly cup that you bring into our Trouts Denver or Trouts Frisco locations will earn you one (1) entry to win a LIMITED EDITION Abel Super Series 5/6 Johnny Cash Fly Reel and the Sage X 590 Fly Rod. If you can't drop your old plastic fly cups off at either of our locations, you can mail them to our Denver location. Make sure to include your full name and e-mail address!